Oh my….what to say, what to say! So much to do and what to pick to talk about. The day after the trip to Florence, we did laundry, rested up and made a reservation with our hosts here at Casa Rondini for “fish night”. Previously they’d called it mussel night and we’d gone somewhere else. I’m fairly unsophisticated when it comes to various seafood you might say. But, what the heck, we decided to go anyway. We ended up with an insalada with eel, and something else that skips my brain right now. I was shocked that this dish was so good so I perked up some. The New Zealanders dining with us that night pronounced what we were eating or I mostly wouldn’t have known. Well, I say that I still would have known those baby octopus and I think I spied a snail. We even has a cuttlefish,crawfish, mussels, and some anchovies………oh me, if I hadn’t been too embarrassed I would have passed on the anchovies. I went ahead and got out two of them…Probably the best anchovies in the whole world if I could eat two. .They had a lot of garlic, oil and spices so that helped. The fried calimari was good. Wish I could remember what one of the other main dishes was with all the veggie stuffing but I can’t. We had a lot of courses including the wonderful torte with ice cream. One of the people from New Zealand informed us our host, Franco, had been a chef in London………wow, how lucky can you get! Can’t wait for Pizza Night sometime before we leave. The next day we made a drive to Arezzo and found a good parking place, walked around, ate again (of course) and happened upon a great little art supply store where,of course, we found a few things we couldn’t live without. I KNOW I WILL PAINT GREAT WORK WITH THESE PAINTING KNIVES. Or they will become a good souvenir of the trip. . We then stopped at an outlet mall on the way back that we heard of….but mostly USA brands. I did find a Moka pot to take home that was a good deal. Today, we took our time getting out and about and then headed for Cortona. 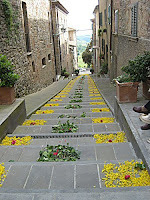 You have to go to the town where “Under the Tuscan Sun” was filmed, huh! We found a good place to park……….and lo and behold, a neat little shop with art glass jewelry. Woo-woo….just couldn’t pass up that lovely bracelet and Carolyn got a great, unique ring. Nice young artist guy there, too, to tell us about his work. We did another of the wonderful lunches there………..this time the Bistecca Fiorentina…very delish. Then since we had all that food, we had energy for another marathon climb to another church, Santa Margherita. Mass was being held so we could only glance around inside this beautiful Romanesque-Gothic church. 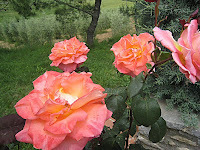 I did make a few pictures in Cortona, none at Arezzo but decided to share a picture of one of the many rose bushes right here at Casa Rondini. There are wonderful beds of roses and other flowers all over this place. I told Carolyn I never knew Italy loved roses like they do here. They are everywhere you go, from the lowliest to the fanciest homes and businesses……..even the gasoline stations. Hum, what to say, what to say! What can you say about places with such a long history. I’d visited briefly before and went to the main museums (Uffizi and the Academia) but really didn’t know or see that much but take in the old city near where we stayed. 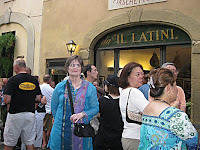 This time I stayed at the same location just off the Doumo Piazza but had Carolyn with me. She teaches art history………..so for sure, I had a font of knowledge right there with me. She’s also been there many times in the past. So we made the rounds…and I do mean rounds and at about 92 degrees and many miles of steps we were bone tired by the end of the two days.But, I digress as I’m prone to do . 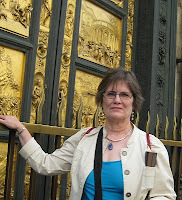 Carolyn had never been to the Santa Croce cathedral so we went there that first afternoon. The next morning we set out for another place she’s always wanted to see and hadn’t……The Basilica of San Miniato Al Monte (top of the mountain to you, and especially to me. I thought I’d never get to the top of the steps that seemed to go on to infinity. If there is a place like this worth the effort of the climb, this one could be included. It is so beautiful, this 1000 year old church. The night came and we decided to go to Il Latini, a restaurant my daughter and I had a good time at previously.We shouldn’t have as we were so tired we felt ( or I did anyway) it an effort to eat and smile. they seat you at a table with 4-8 people communal style. Our bad luck was to get seated with a young woman who looked about 15 with her boyfriend who looked over 40. She was from Kent England she told us…and did not deign to make another comment even when prodded (graciously of course )…her date was nice and the other people on the other side were too far away with her in the middle to converse with much. So ………early in the morning we got up never dreaming we would have the energy and headed up to the Basilica mentioned previously. We’re doing pretty good for two old (nah) broads. And, we got in a little leather shopping running around as well. On the way to the train station to return to Umbria, Carolyn took this picture of me in front of the Baptistry at the Florence Cathedral. And I took hers. By the way……..Carolyn’s blog for this trip is located here. I’m sure we’ll have some overlap but much with a totally different perspectiv. 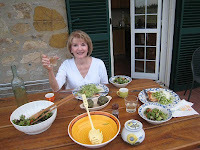 Later that evening of the 26th, we cooked a chicken breast cutlet, made a salad with some fresh peas from the garden here, walnuts, tomatoes, leeks from the garden and a vinagarette, and a pasta with tomato and percorino. 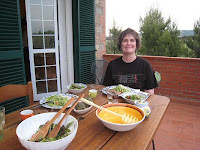 Carolyn also steamed a couple of artichokes from the garden here. We served it outside on our front terrace with some of the house Bianco. Delish…………off to Florence in the morning on the train. We spent much of Sunday with laundry, trying to get on the internet to upload a blog entry interrupted the previous day. Finally, I got my entry and pictures uploaded but was in the middle of an IM sessionwith Cynthia when it went out again. No more internet for the rest of the day/night and none this morning on Monday as well. We were talking with our hosts and accidentally (and fortunately for us) found out there was a celebration of some kind (religious) in the little town down the road…Montegabbione. 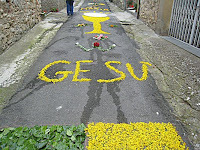 They outlined all the major central streets with chalk and filled in the spaces with flower petals to “paint” symbols of Christianity. We got there early before a procession of some kind would wipe them out and took pictures and generally just took in the sights and preparations. Very beautiful, indeed. 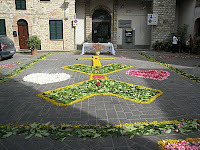 And so interesting to find the continuance of celebrations such as this that have come down probably from the ages to the present day.We left before the procession to head to Citta Della Pieve (one of the favorite towns for us around here) for another “celebration/procession” there. We found an ideal observance point in a small bar with outside tables right across from the main staging area. There was supposed to be jousting somewhere but we must have misunderstood the timing since we never found/saw it. We were there to record on two short two minute videos the procession through the streets. 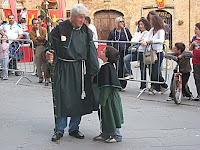 Men wearing robes……..all religious, etc, children (some so small to have their mamas escorting them, and the men having to bear the weight of numerous crosses and symbolic heavy decorations of all kinds. Forgive me for not knowing what much would mean as I’m not grounded in Catholicism at all….nor in art history. The videos are almost 200 mg each for two minutes each. I have no knowledge of compressing them so they can be up/downloaded so will have to figure that out at some point. The little Canon camera is great for these little short recordings. As an aside, we met some nice people from Cheshire UK there for a choir performance…but it started too late for us to hang around and still get back early enough to have something some dinner on the way back to the apartment. We went back through Monteleone d’ Orvieto to stop at a place known to our hosts for barbecue and pizza, La Tana del Gufo (OWL) Wonderful thin crust Capricciosa pizza for both of us and a small bottle of the house Bianco. I think we may go back there again before leaving Umbria as this is on of the little towns we can see from our back terrace. The rest of today (if no internet returns) will be spent trying to figure out what will fit in the small rolling laptop bag (sans laptop) for the trip by train to Florence early tomorrow morning. Or maybe also to just wander around as we are prone to do. The sun is shining …or comes and goes and we can hear the tractor and our host hard at work on the place.